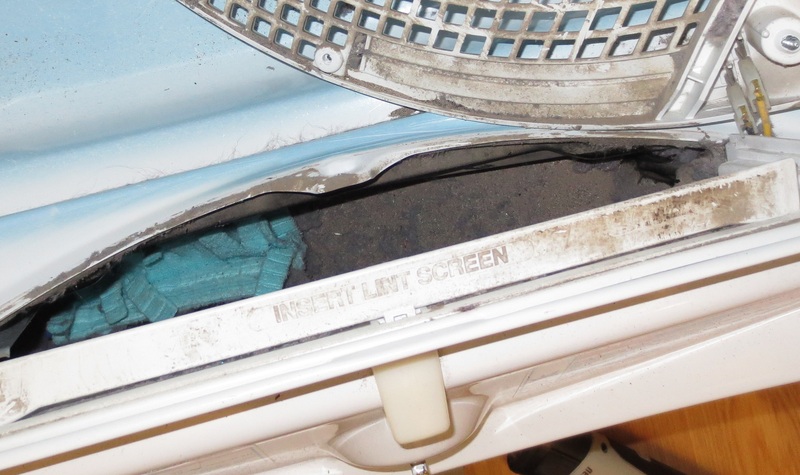 We all know that we’re supposed to wipe our dryer lint screen clear after (or before) each load, right? Personally I like to wipe mine after each load so it’s ready to go for the next load. But how often do you deep clean it? And how do you deep clean it? Do you wash it with warm soapy water? Do you clean the compartment that the screen slides into? Once a year I take my lint screen out and thoroughly vacuum it and then wash it with warm soapy water, and I’ll stick my vacuum cleaner crevice tool down the “chute” that the lint screen slides into. I probably should do that more often, especially since we wash/dry at least 5 loads of laundry every week. We’ve noticed over the past year or so that our dryer isn’t drying as well as it used to. We’ve cleaned out the vent (where it goes into the wall and where it comes out of the house) and that didn’t seem to help much. Further raising my concern is that my lint screen has been looking weird the past week. There’s lots of lint, but there’s a 6″ diameter section with NO lint. I had a few spare minutes this morning so I thought I’d investigate and clean the lint screen. I took the screen out and vacuumed and washed it. Then I vacuumed the inside of the housing like I usually do, but I could see there was still quite a bit of lint in there. I thought I’d be clever and use one of those Swiffer Duster gadgets to clean the inside (I have one with a reusable microfiber pad), but when I pulled it back out only the handle was in my hand- I lost the dusting pad! I tried sucking it back out with the vacuum, but no luck. That meant I had to unscrew the housing for the lint screen chute. Five screws later (and a flashlight and drill because I was too tired/lazy to use a screwdriver)….lo and behold….this is what I saw. I wonder what else might be in there? And this is how it looks AFTER I’ve already stuck the vacuum crevice tool in there! I used a kitchen scrub brush to scrub the lint off all the surfaces and then vacuumed up what was dislodged. Yes, two paper towels covered with dryer lint and debris. The pile is about 3″ tall! YUCK! I also found a variety of small items (snaps, buttons, pins, pellet gun bb’s, screws), but nothing of value. And YUCK that the lint and debris is all gray and dirty. Is that from my clothes or is that actual dirty yuck? Hmmmm. And I’m thiking that’s A LOT of stuff from just the entrance of the chute! No wonder our dryer hasn’t been working so well. Unfortunately, I didn’t have time to pull the dryer from the wall and clean the other end, nor did I have the ability to run any gadgetry (squirrels or bunnies) through the chute to clean it that way….I’ll have to save that for another day. Anyhow- I dried a load of towels (the ultimate test) and for once they dried in the designated amount of time- completely dry- with hardly any lint on the screen! Next Next post: Carryon….. to Vegas!